Providing greater speed and power compared to the LST1, the LST1+ Water Well Drill features a 3,000-psi hydraulic system for a rotary speed of 95 rpm at 10 gpm. 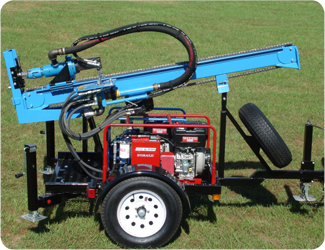 The LST1+ is capable of drilling a 6-inch borehole to a depth of 300 feet. The well drill’s robust hydraulic system generates up to 5,000 pounds of pull/push-back force for efficient drilling in rugged terrain. The convenient bypass flow system allows precise control and adjustment to achieve desired push-down force, while a three-way ball valve enables the operator to quickly bypass mudflow when adding pipe. 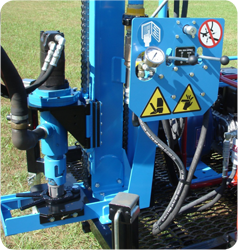 The drill’s swivel base design swings the rotary aside for quick, easy access to the borehole. 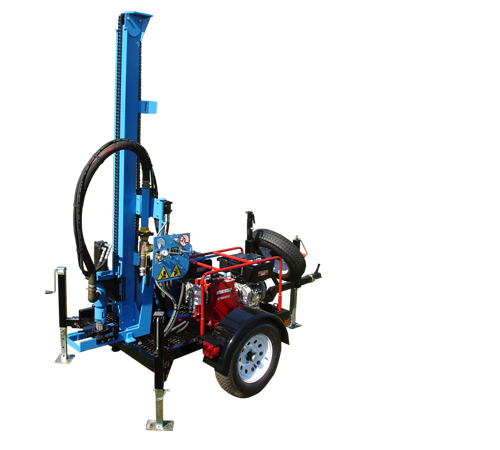 All trailer-mounted drills can ship fully assembled in a 20-foot container or knocked down and palletized.